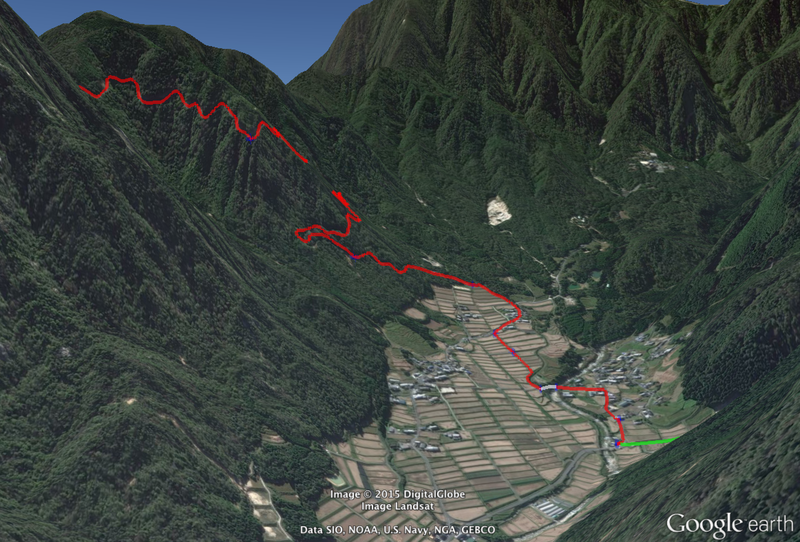 In the screenshot of Google Earth above, you can see the route that I rode my bicycle last Wednesday... the little bit of green coming in from the right is a downhill section of road, followed by the long red uphill section through the tiered rice paddies of the village, then up the mountain on an old road no longer open to traffic. I'd ridden 55km (34mi) to get to that point, and would end up riding 72km (44mi) farther before I got home, but ever since my first “real” ride in February, I've not been so interested in how much distance I've covered, but rather, in how much mountain I've conquered. This means the important statistic for me is how much “vertical climb” or “elevation gain” I did during a ride, the sum of all the rises/climbs/ascents on the route. And it's not just me... vertical climb is often used as a badge of achievement for a ride, and seems to get more talk than distance. It's a strong reflection for how tough a route is. The problem is that it's difficult to figure out the vertical climb for a particular route, and commonly-used methods are often wildly inaccurate. Cyclers I've met record the ride with a GPS unit of some sort (their iPhone, a bike computer, a runner's watch, etc.) 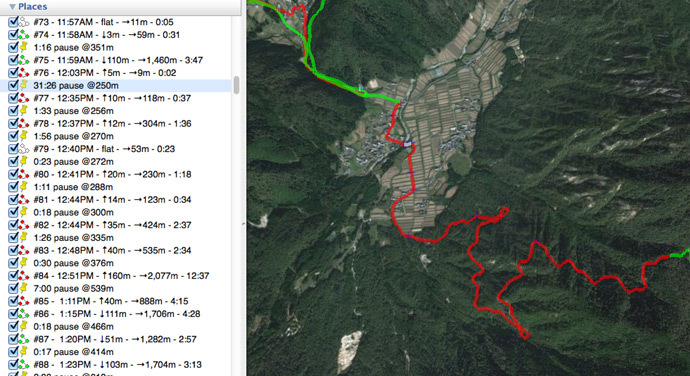 and upload the data to Strava, a service that allows you to analyze your activity and share info about it with others. It's very popular and mostly very well done. Footnote: I've since beat it again, but by only 10 seconds. Since it was my first real ride, I didn't know any better but to be impressed by the 3.3 kilometers (2 miles!) of vertical climb that I'd done. I was amazing. I was Superman. Over the course of several big mountain rides, I'd started to feel that the numbers reported on Strava were quite a bit inflated, but I couldn't put my finger on exactly how. 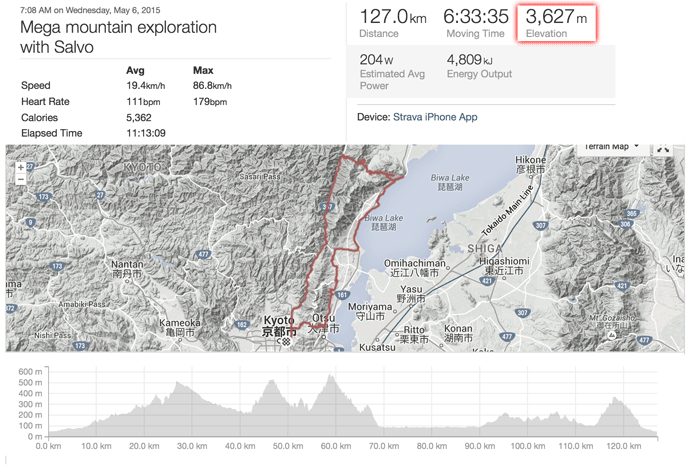 A week or so ago I posed about another ride, “Short but Intense Bike Ride in Northern Kyoto”, where someone commented about the apparent discrepancy between reality and what Strava reported (and hence what I claimed). This spurred me into investigating, and I've spent the last week digging in, writing tracklog-analysis software, doing tests, etc. So, when I went out on a long ride last Wednesday, I brought an arsenal of equipment with me, recording five separate logs with three different GPS/GLONASS-equipped devices. The trip ended up being my longest ride ever, about 125km (78mi), and also had the most vertical climb I'd ever done in one day. Among the many ways I recorded the trip's data, I used Strava's mobile app on my iPhone 6+, and when I was done I had the app upload all the data to Strava. The elevation graph at the bottom is an accurate representation of the 11-hour ride, with four separate major mountain peaks transversed, along with many little ones (though they each didn't seem little at the time!). 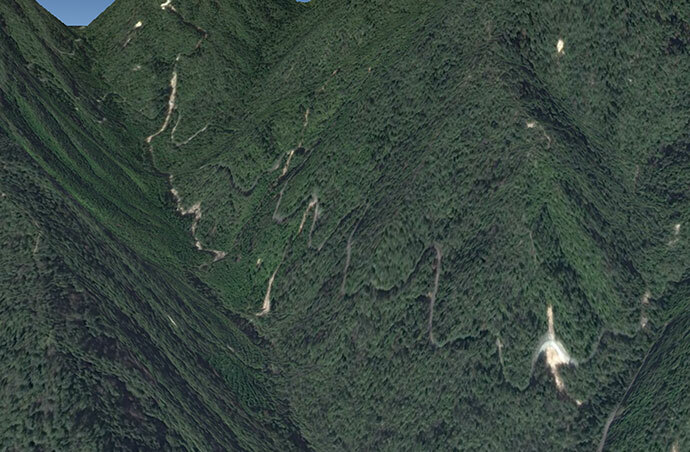 Strava informs me that the trip encompassed an impressive 3,627m (11,900') of vertical climb. It looks like I started at about 50m and initially climbed to about 500m, and from there went down and up quite a bit — and believe me, I did — but looking at the graph it's difficult to come up with a 3,637m sum for all the “up” parts. In reality, I believe the vertical climb on the trip was about 2,225m (7,300'). First, let's look at why Strava's numbers are so wrong, then let's look at how to get a better answer. There are various ways a unit can record your elevation as you travel, and all of them are generally untrustworthy. Modern units like an iPhone or a dedicated unit like a Bad Elf GPS Pro+ have three methods to figure altitude: GPS, GLONASS, and a barometric altimeter. 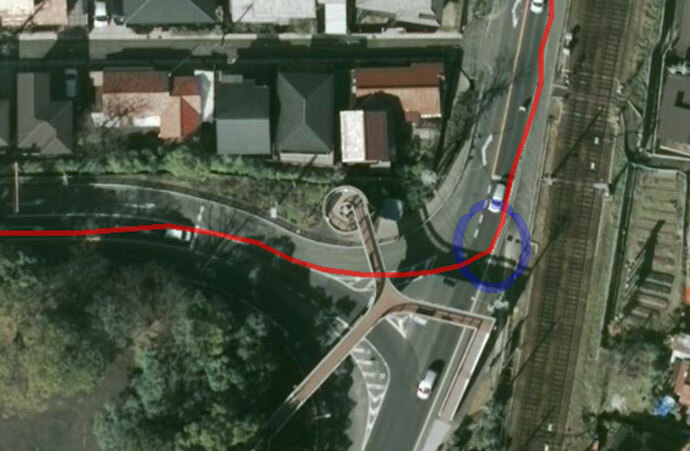 GPS/GLONASS can be fairly accurate with your latitude and longitude, as I've discussed in prior posts, such as “Informal GPS Logger Test: iPhone 4s GPS is Shockingly Good” and “Another Informal Location-Logger Test”. It's fantastically-amazing technology that is perhaps the only time we come in contact with something that must actually take into account Einstein's general theory of relativity. But it's not perfect, and of the three dimensions, elevation is by far the least accurate. When wishing to track vertical climb, the absolute accuracy of a unit is not particularly important, it's the relative accuracy and stability that are important, and it seems that barometric altimeters provide better results. My first experience with a barometric altimeter, on a Garmin GPS unit a decade ago, was very bad. If there was a breeze or you walked with the unit, it would record a non-trivial change in elevation (up or down, depending on how the unit was physically angled relative to the air movement). It was ridiculous. That's quite a range of results from the very same trip. Which is correct? Frankly, probably none of them. Strava's iPhone app has access to both iPhone altimeters (barometric and GPS/GLONASS), but in the end it uses neither. Rather, it throws away that elevation data and instead relies on its own database of elevation data (likely the same data that Google uses to show 3D elevation in Google Earth). Both the climb and the descent were quite straightfoward; the climb was a solid climb without any downhill breaks, and the descent was a solid descent without any uphill sections. 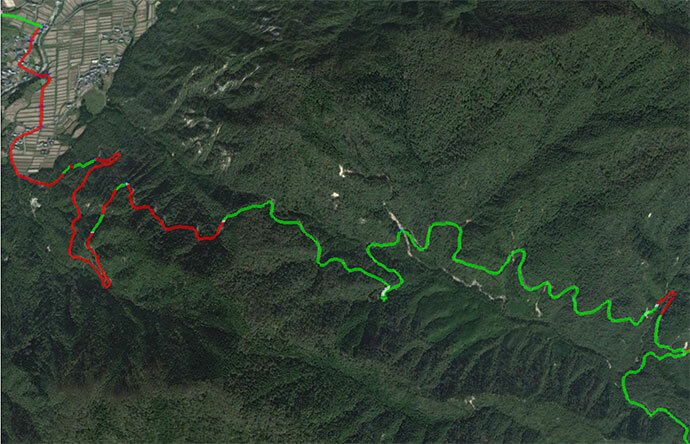 That's why the ascent is a solid red line above, and the descent is a solid green line. I should be clear that I'm not complaining about Google... the resources they've freely gifted to the world in Google Earth and Google Maps continues to amaze me, and I'm extremely thankful for them. I'm not quite sure that I'm complaining about Strava. 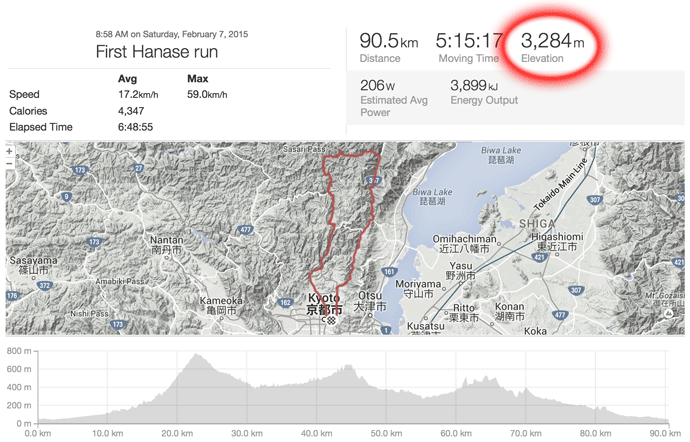 Perhaps these easily-avoidable inflated results are particular to my area of Japan, and the rest of the world enjoys added accuracy due to Strava's policies. I don't know. But I do know that a lot of folks around the world complain about Strava's inflated elevation claims, so at least I know that I'm not alone. First of all, I should note that Strava does respect the recorded elevation in some situations where it recognizes that the data was recorded with a barometric altimeter. Their own iPhone app, however, either doesn't use the barometric altimeter or doesn't notice that it does, so users get stuck with Strava's wild elevation data. Where Strava does accept a device's elevation data, they offer the user a way to get “corrected” data, whereby Strava throws away the user's data and replaces it with their inaccurate elevation-database data. This results in a much less accurate result for many folks, but they offer no way to undo this action, so if you bump the link by accident, you're hosed. They also don't allow you to toggle between your device elevation data (barometric or not) and their data. It seems that they really want to push their data, and who can blame them? Folks like me early on, ignorant of the hyper-inflated vertical-climb data, get an ego boost from seeing the big numbers. I suppose boosted egos help their business interests. Luckily, one crack in their anti-reality armor is that they allow geeky types like me to create tracklogs with other devices, then modify the tracklog to force Strava to accept the elevation data as is, and upload that. I've spent the last few days writing software to analyze tracklog data, to smooth it out, and to derive meaningful information from it. The first step is to identify when you're stopped, because if you're not moving, you should have no elevation gain or loss, no speed... nothing. You're stopped. Then my software goes through the entire trip to find the highest peak and the lowest valley, and pin the elevation at those locations. That divides the whole trip into four parts, each of which is subject to the same analysis, and this analysis recurses (repeats onto itself) over and over until the difference between a local peak and a local valley is almost within the range of noise. Once all these local peaks and valleys are found, the elevation of all the points in between are smoothed using a moving average. The elevation of each peak/valley point is left undisturbed, and it's the elevation rise between them that adds up to the trip's vertical climb. The red line at the far right ends at the Shirahige Shrine (seen here in the report on a ride two weeks ago), which we visited briefly after having come over the mountain, before turning south to ride home. The distance from the shrine in the background to the spot in the foreground where the route turns 90 degrees and pitches up into the mountains is 30km (18mi) as the crow flies, which I mention for scale. 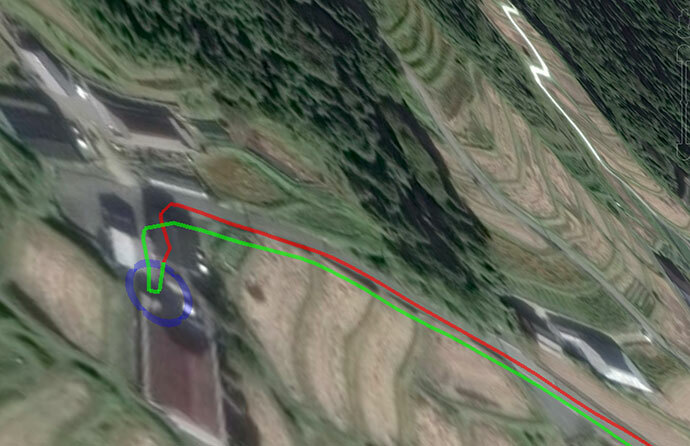 If you'd like to see it yourself, you can download the KML file (with pauses / without pauses) to view in Google Earth. The “with pauses” view is best for me when I want to “relive the experience”, and I can see, for example, that I stopped for half an hour — 31:26 — to eat lunch (at this place that I last visited seven years ago), and then progressed up the mountain stopping at intervals for photos, to check directions, or to fix a popped chain. The duration includes all the intervening pauses, rendering it fairly meaningless, so I should probably simply remove it, but at the moment it's still there. Anyway, I did this analysis on all my tracklogs, and found that the one produced by the Bad Elf GPS+ with barometric altimeter seemed to most match reality, so that's the one I consider, relatively speaking, “correct”. They somehow came up with an extra 100m of vertical gain, but since I truly don't know what the actual value is, I can't say that they're any less wrong than I am. 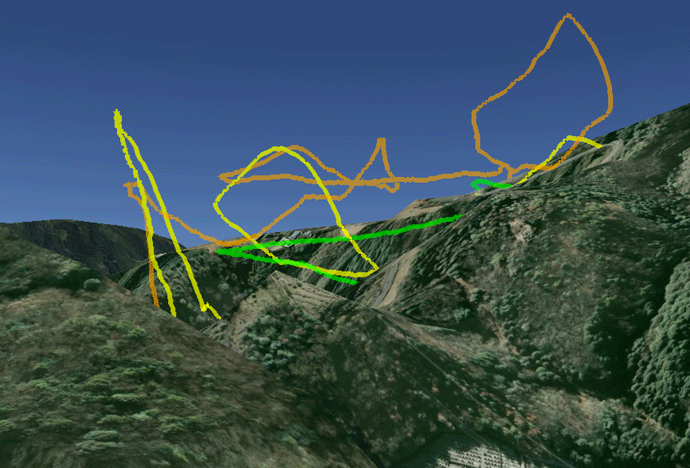 I didn't have a good barometric-altimeter tracklog for one of the rides. The amount of “Strava inflation” is shocking. If I could solve this problem for myself in a couple of days, you'd think a real company with presumably smart folks could come up with something. Anyway, I'll need to find a better app for keeping tracklogs on the iPhone, one that lets me record both the GPS/GLONASS elevation and the barometric elevation, and also my heartrate. As it is now, I'll use a klugy mixture of various devices and combine all the data myself, massage it, smooth it, and then send it to Strava. If they ever get around to addressing this, I suppose that would be a good time to bring up the next issue: they ignore elevation changes when calculating distance. They correctly note that the difference is perhaps at most 2%, but on a 100km ride that can still be over a mile wrong. I’m just wondering if you have found an app that actually records both the GPS/GLONASS elevation and the barometric elevation? I don’t need heart rate, but it would be great if it records that as well. I did a quick search on Google without any success. If you know or anyone know of such an app, please let me know! It’s pretty disappointing that Runmeter doesn’t produce a 1hz track log. IIRC, I think that’s one of the better running apps for iOS. Do you have anymore details to provide about your conversation with the developer? I’m also interested in their Cyclemeter app, but I might avoid using it if that also doesn’t produce a 1hz track log. Will they eventually add the ability to create a 1hz log? Thanks for the response. I don’t see a way to respond to your post so I’m going to have to create a new post. I decided to contact the developer of Cyclemeter and expressed my concerns base on your findings. Hopefully this will create some pressure and get them to do something about it. Accuracy is very important to me! So have you contacted a bunch of track log creating software developers to see if they can add such a feature to their app? Or it’s just Geo Tagr? I guess if anyone knows, it’ll be the software developers. I’ll contact Geo Tagr myself and any other software developer that you can think of to make such a feature request! iOS sends position updates to an app “whenever it feels like it”. This could be 10 times a second, it could be once every minute. There is NO guarantee for position polling frequency provided by iOS for an app. The overall operating system determines what _it_ thinks is a significant enough change since the last position update (or that it thinks enough time has passed that it will send along another update just for good measure). OK, now that that’s said … why do some of the other apps have more frequent updates and seem to record at a 1Hz rate when Runmeter seems to record more slowly? One possible explanation (and I have no inside information here about Runmeter or the other apps, this is just a guess) is that Runmeter is actually recording what the OS gives it, nothing more, while the other apps are interpolating data points to ensure at least a 1Hz recording rate even if they don’t get updates from the OS that quickly. For example, the OS supplies the position updates of t = 0, x = 0, t = 1, x = 1, t = 3, x = 3. Maybe Runmeter is just recording those three specific updates with no processing of the data while the other apps are going in and “creating” a point of t = 2, x = 2 as an interpolation between the actually given data points? Again, just a guess and I could be completely off. I have had the same experience – a particularly bad error creep occurs when holidaying on the Amalfi Coast. The coastal road from Sorrento to Amalfi is as level as the civil engineers could get away with, but still undulating. GPS error in the forward/backward direction pretty much comes out in the wash, and GPS error laterally doesn’t add much overall distance. However, given you’re cycling along the side of a very steep piece of terrain, even small lateral displacements result in large elevation discrepancies. One minute you’re atop the cliffs, the next you’re in the sea. It might be worthwhile having a chat to the guys from Wahoo Fitness. I find it’s the best iPhone app for recording an activity, and then uploading to other services incl. Strava from there. They might be open to logging barometric as well as GPS altitude? I’ve often thought that the state of altitude recording is woeful; am a trail runner so it matters a lot to me too. I come from a background in robotics, and have a number of ideas on how to integrate the two altitude readings to give a proper real-time altitude; you’ve touched on a few of them already. So I heard back from the developer behind Runmeter. This is what they told me after asking them a bunch of questions. Our app has the GPS set to give us as many points as it can, as fast as it can, with the highest accuracy it can. Once it does, however, we remove points that are nearly collinear, making sure that we gather a point at least every 50 meters or so. (We never add or move GPS points.) We do this for two reasons, one being that it makes for a smaller storage size, but also, it reduces the memory we need to use in the iPhone while displaying information in maps and graphs. We work very hard to be sure that key data, like splits and intervals and maximums and such have the highest fidelity possible. Serious cyclists we work with tell us our data collecting and import/export is the among the best for iPhone apps. If you use a sensor such as speed or a heart rate, we gather that information with one reading ever 2 seconds. In our experience, gathering at a higher rate doesn’t appreciably increase accuracy or precision, and it nearly doubles the data that needs to be collected. However, many people perceive that 1hz monitoring leads to higher accuracy, and we respect those perceptions. Not sure if this information is of any use to anyone here, but I figure I would post it. Jeff, it would be great if you can make such an app. I’d definitely buy it! With your skills, I’m sure it won’t take that much time. Plus, if you start now, you can finally figure out if it’s possible for the IP6+ to even record both the GPS/GLONASS and barometric elevation data. I’ve contacted them and suggested it; they’ve “passed it on to their developers.” I already am an authorised developer for their SDK (am developing a HW product as a hobby) which gives you all the functionality of the app; I just need some motivation to get the app started… would basic location + both altitudes + HR do the trick? 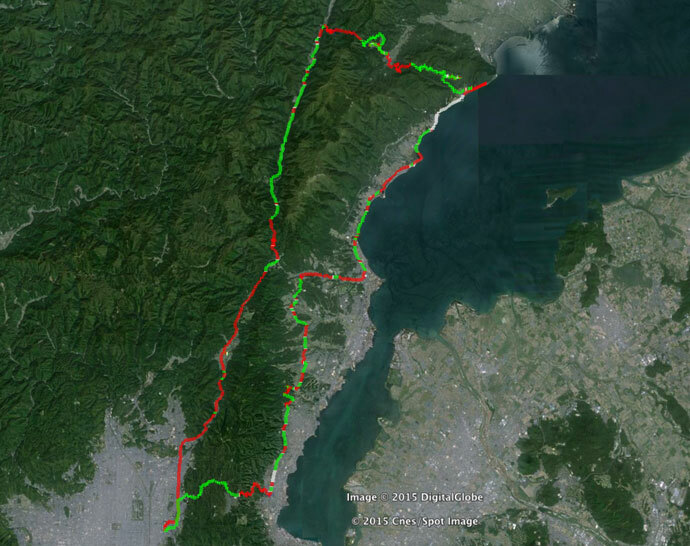 I use my Xperia z3c with ipBike and upload to Strava. On my last few rides along some regular routes I’ve noticed a fairly consistent altitude difference between the two apps – ipBike generally reports about 55-57m less overall altitude gain than Strava. Before I enable ipBike’s “hey Strava, don’t muck with elevation” feature I thought it would be interesting to see what I could extract from the gpx data and try to match it against an external source, a bit like what you’ve done – but probably not so polished! I almost always ride in urban areas of Brisbane, Australia, so there’s almost always a good GPS signal. Perhaps 95+% of my rides are on bike paths or roads with known GIS data but occasionally I’ll get the mtb dusted off and go bush bashing. About 2 weeks ago I had a great 40km ride on one of those regular routes which both ipBike and Strava reckoned was only 100m long – despite the ipBike summary recording the correct distance. That was infuriating enough that I dug into lxml.etree to do some recovery work. 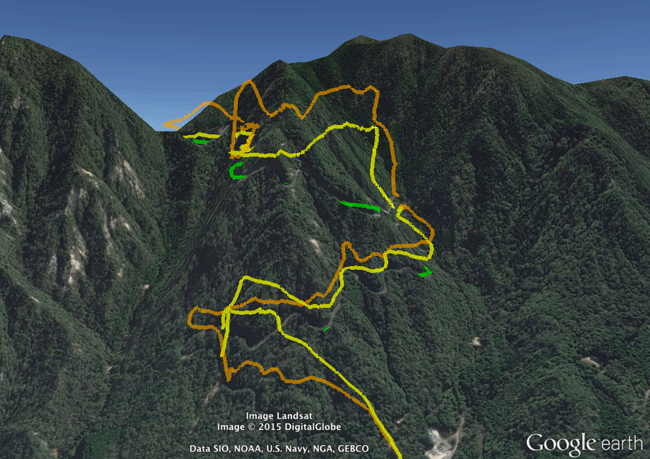 https://www.jmcpdotcom.com/blog/2015/06/01/fixing-up-gpx-ride-data-with-lxml-etree/ is where I rambled on about what I did. I have very little experience in data smoothing, so if you’ve got some handy pointers to algorithms and/or best practices I’d really appreciate the tip. As an aside, I wonder what you process your photos with? 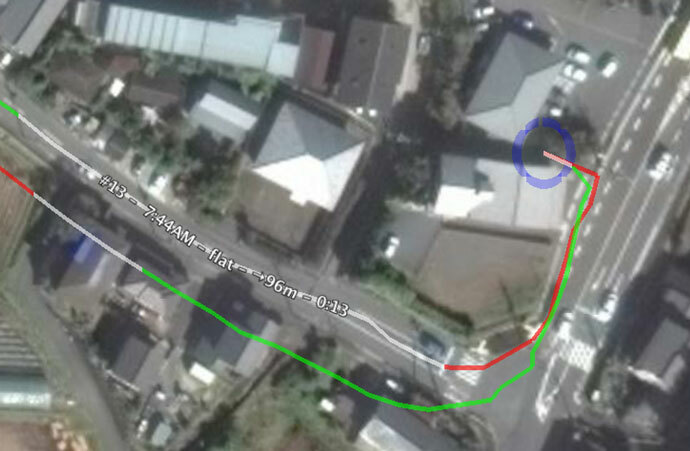 The track looked quite straight – from my home to 100m up the street was where the unique lat/lon elements ended. I had 6400 or so track points allegedly at the same point on the road, just with different elevations, cadence, hr and speed! It was an incredibly overcast day – in your experience can that make a difference to how well GPS signals are received by handheld units? Very interesting and eye-opening article. I live in the north of Spain, in a pretty abrupt area with lots of mountains and lots of narrow and deep valleys. I’ve been using Strava for 3 years already, and the funny thing is that for the first few months, both the elevation gains and profiles seemed fine or at least believable. I guess that, at that time, the reported elevation was being computed directly from the recorded GPS data. After a few months I started experiencing the very same issues you describe in the article, and it became quite frustrating to get these “spiky” elevation profiles. At first, I thought it was my phone, or even the rather old OS I was using, but I see it has nothing to do with the actual device you use. What I don’t really understand is why they push their DB data over the GPS elevation data. The latter might not be the most accurate but perhaps they could try to smooth it out by averaging routes that go over the same places. Or, as someone in the comments suggested, combine the GPS data with barometric data if the device has that type of sensor. I have an oldish Garmin speed/cadence sensor to go with my 800 GPS and when it detects the sensor it calibrates it (presumably using gps speed – no need for wheel size to be entered) and then uses that for speed. When I’m stood still at a junction the display reads 0.0km/h. Without the sensor it floats around the 0-1km/h range. On occasion I’ve pressed the “correct” button on Strava only to regret it given the whacky numbers it’s provided so I’ve just removed it and uploaded it again. Sending you a standing ovation from Arapahoe, Pamlico County, NC . That was the most enjoyable technical analysis I have ever read and the aside about Lady making Tofu… superb man! Jeffrey – thanks for shedding light on these discrepancies! I shared your interesting blog on our FB group “Mountain biking around Ubud/Bali”. I usually use your lightroom plugins but the blogged popped up in a search result. We’re in Okayama for two weeks and I went for a walk and runkeeper shows strong gps signals but would not track. Anyhow, this was a very interesting read. Im off to reasearch why my runkeeper is not working here. Stumbled across your (excellent) post. My question is : what would you suggest to mitigate the impact of tunnels/bridges and extreme terrain on assessing a course’s gradient? 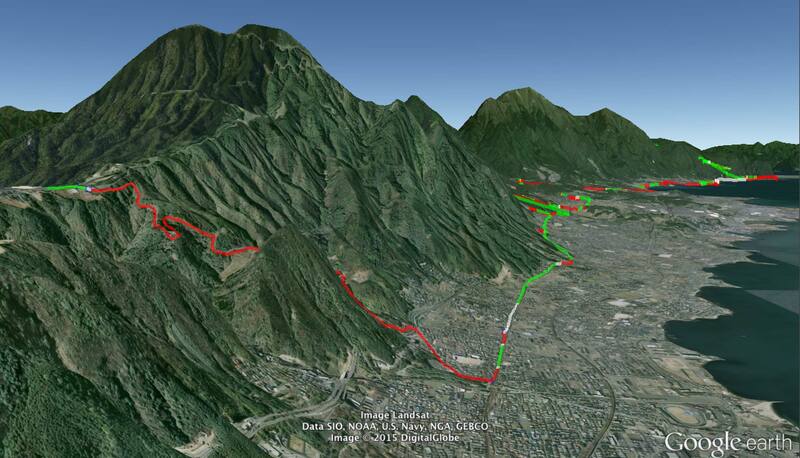 I’ve been using gpsVisualizer’s “best source” elevation data to compare potential courses in preparation of a bike tour. I use point-to-point elevation data to compute 300M and 1KM gradient moving averages. As we travel with kids, I am reluctant to plan a course with a sustained (1km) gradient approaching 8% or a 300M gradient of more than 15%. A more careful inspection of a supposedly “easy” course showing a very steep 300M gradient (75%! 🙂 made me realize that elevation data applies to terrain, not to roads, such that gorges and mountains where civil engineers usually build roads with bridges and tunnels appear more daunting than they actually are. Thank you Jeffrey for this very informative article! I am trying to plan multi-day mountainbike tours here in Albania and should have some reliable information which elevations expect me before starting off. No solution yet after this article, but at least I start to understand & accept that this whole pre-planning of elevation is pretty inaccurate, so I dont expect to much but instead just go out and test. Thanks again and best regards! Wonderful post! I love the plots of how all the track logs differ, as well as the detailed analysis. I’ve struggled with this problem for my own silly little Python script that plots elevation profiles from GPX files (ellie, in the GitHub repo “pytopo” if anybody cares). I’ve tried smoothing the data various ways but I always come out with numbers I know are badly inflated. That’s true regardless of whether I use barometric altitude (from an old Garmin) or GPS altitude (from a Galaxy S4 running OsmAnd) though of course it’s a lot worse with non-barometric data. In your reply to Adam Bridge you said you wouldn’t mind sharing your code that cleans up the KML data and handles lingering at one place — did you ever get a chance to upload it somewhere? I’d love to see how you solved the problem since you obviously have a good handle on issues. From Spain, Strava inflation is here too… just did a bike ride competition with oficial 3000m elevation gain, my sigma rox10 (with barometric) stated nearly 3000m gain, but Strava recorded 4500m gain!! Great article Jeffrey though a little over my tiny brain, very similar to my experience using strava on my android phone. I previously used “ride with gps” and found they elevation gain data more accurate although probably still a little inflated but as soon as I exported it to strava it would whack the elevation up to near double sometimes. I just saw this post while pulling my self off the trap! I recently wrote a Chrome Extension which read the TCX file from the user input and output the Elevation Profile of the course. I use the exact same approach as yours to calculate the Elevation Gain and Loss along the course. However, the calculated results are quite different from what have been reported on Garmin’s website. I noticed that there are only less than 2,000 data points in the TCX file so I was thinking that maybe Garmin had “hidden” some data points. So I use Google MAPs API to get its data. I thought the data points from Google are more reliable. However, the Elevation Gain and Loss are still quite different. So I think your method of using Moving Average is what Garmin did on the back-end server. I applied the moving average to the points. The curve is indeed more smooth and the Elevation Gain reduces a lot, but still seems inflated. My question is how did you set the moving window? I am a runner and mainly focus on Half/Full Marathon so the typical distances are 13mi/26mi, much shorter than a typical cyclist’s distance. Thanks. Fantastic article, thanks so much! Have you released your software yet? If not, it would be fantastic if you could. Do you have any suggestions for those of us who don’t have access to accurate laser-derived elevation data or the time to manually massage each file? What about the accuracy of the altimeter? Is relying on that a reasonable quick-and-easy workaround, assuming fairly stable air pressure? Finally, since it’s over a year since you wrote this, I don’t suppose Strava have since discovered your blog, seen the idiocy of their ways, and shown any inclination to fix things? Thanks again!! For some reason (e.g. stupidity, or expecting you to be older or have a good old UNIX wizards beard) I’ve only just managed to put 2 (regex.info) and 2 (your name) together and realise that you’re THE Jeffrey Friedl who wrote the famous regex book! Very cool. I think an (ideally Free Software) tool for cleaning GPS track data would be quite an effective weapon against these braindead proprietary systems. If it got popular enough (e.g. via DC Rainmaker), I would expect word about the issue to spread around at Strava, Garmin etc., and who knows, they might actually grow sufficiently motivated to fix it. BTW I also bought an Edge 820 recently, and noticed that a) the altimeter calibration option is quite hard to find, and b) when it records tracks which partially go under sea level (which may or may not be due to lack of correct calibration), both the Garmin and Strava Android apps get hopelessly confused. I guess some of their software engineers made dumb assumptions that elevation data would always be positive. So presumably that’s bad news for folks in the Netherlands, or other areas of the world which genuinely dip below sea level. I reported the bugs to both companies, and got no response from Garmin, and the most braindead series of replies from a Strava support guy who got fixated on the calibration of my altimeter and couldn’t see the wider problem relating to negative elevation readings. P.S. your blog didn’t automatically email me via email when you replied to either of my comments, although it *did* email me about follow-up comments from other people. From time to time I film my routes to get possibility to repeat it “indoors” (on the turbo trainer). 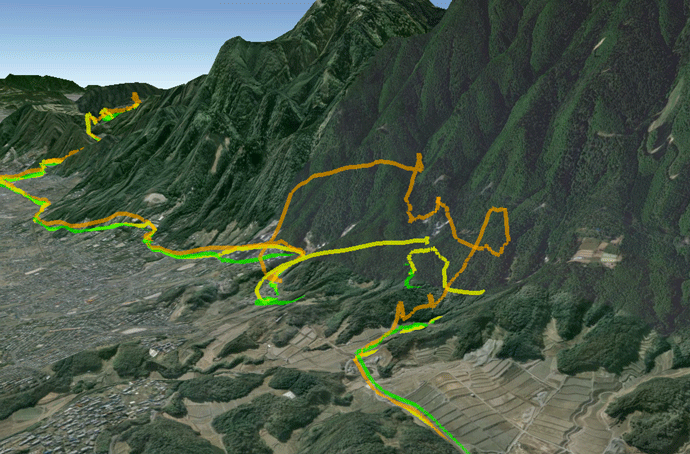 I convert GPS track and video into something called Real Life Video. I’m not happy with these, in the profile there are strange issues. Several months ago I’ve found nice method of “computing” CdA. The method proposed by dr R.Chung. This method rely on power meter and speed. Yes.. the only issue is to have power meter. Does it sound enough irrelevant? I mention it.. because the intermediate result of the method is called “virtual elevation”. With very simple maths you can get nice altitude diagram. In very custom conditions (eg. no wind, same surface, same riding position, no brakes, etc) “virtual elevation” might (should?) mean “real”, or at least it don’t have same issues as it was taken from GPS or (even) barometer! ..Around 2% difference between horizontal run and actual distance. Um.. Not so when trail running where you regularly meet slopes in excess of 20 degrees (short by 6%), some are 30 (short by 13%), and can even reach 45% (short by 30%) at times. Now THAT is a long way out. First of all, Thank you so much I’m amazed by your great detailed post. It is a while that I’m asking my self and my friends how can it be that on each of my bike rides I find a difference of 20-50% in elevation between Strava and Endomondo. I am glad to finally find the answer. I stumbled across this page in my search for answers on this topic and I think of all the stuff I’ve read, this is just brilliant. I use a Garmin Edge 25 (no barometric sensor) and a newly bought Bryton Rider 410 (with barometric sensor) and the difference is astounding. My daily commute, which I know is relatively flat, has had its elevation gain halved with the Bryton unit. The course profile on Strava also shows a more smooth, less bumpy journey than the Edge unit, more in line with how I feel the ride has gone. Yes, I may no longer be putting in ‘massive’ amounts of climbing when I go into the hills but at least when I’ve climbed 1000m I can relate to it and accept it as truth. 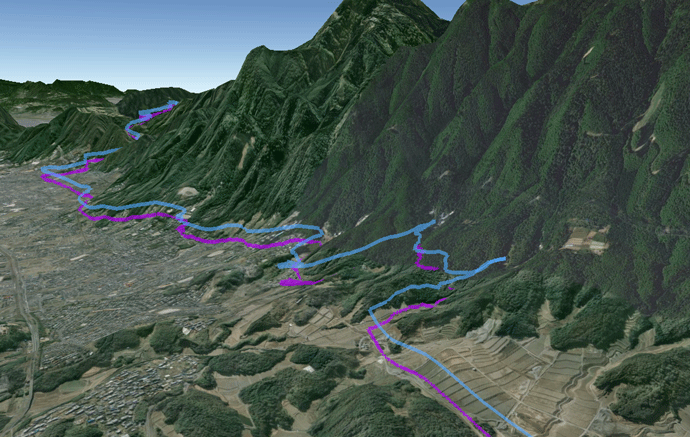 But just imagine the amount of over inflated elevation data swimming around on Strava!!! My next gripe with Strava though is that it is skewering the time elapsed data and hence the average speed data when synched from the Bryton unit. Don’t know if anything can be done about that though. Thanks for all your time and effort in preparing this information – it is invaluable! Hi Jeffery! Thanks for the prompt response. The Bryton is set to QZSS mode at the moment. I wonder if setting to GPS +Glonass is worth giving a try? Might it be that the strava site is misinterpreting the time information? On tonight’s commute back Bryton said I was moving for just under 60mins of a 67min trip. Strava had me moving for over 66mins of 67min trip, but I know I was stationary at lights and crossings for more than a few minutes. Shall keep looking into it. Thanks again! I’d reached out to Bryton once to ask about the settings, but not heard back. Your message prompted me to reach out again, this time to their Japan contact, and I got quite the surprise of a reply. See it here. The “TL;DR” summary is that in Japan we want “GPS + Beidou”.